C.J. Grant, The Political Drama No. 6. The Modern Puritan, published by G. Tregear, 1833. I’m delighted to introduce another guest post by Daphne & Mike Tregear. The Tregears are descendants of Gabriel Shire Tregear; a well-known publisher of satirical prints in early nineteenth-century London. Having previously provided us with articles on Tregear’s life, his publication of the Rum Jokes series, and his somewhat tempestuous relationship with the artist C.J. Grant, they have been kind enough to offer some further thoughts the The Modern Puritan, a caricature produced by Grant and published by Tregear in the spring of 1833. I’ve included a brief addendum of my own at the bottom of the article, which aims to explain the immediate political context in which the print was created. No. 8. John Bull or an Englishman’s Fireside! We do not know that numbers 1-5 in the Grant/Drake series were ever published by Tregear nor the order in which they were published. In the Tregear series all of the known examples were lithographs while the Drake versions were woodcuts. It might be supposed that Grant and the two partnerships were aiming at two different markets or, perhaps, two different client groups. The cheaper, less nuanced, version by Drake from his premises in Clare Market aimed at the mass market and the more expensive by Tregear in Cheapside. Pound  notes that “The two (Fireside) prints are almost identical in composition, although this one uses the tonal qualities of lithography to great effect and allows for much greater detail, especially in the figure’s face”. In both number 6 and 7 one of the principal targets of Drake’s satire is clear. He is Sir Andrew Agnew, 7th Baronet Agnew of Lochnaw, who was the Member of Parliament for Wigtownshire from 1830 to 1837. He stood as a moderate reformer but took up the cause of Sabbatairism, seeking to ban all labour on Sundays. He introduced four Sabbath Observance Bills into the House of Commons, none of which were passed. In the “The Modern Puritan” Agnew is shown standing in the centre of the print dressed as a Puritan with dark coat and knee breeches, a large white shirt collar, ruffs at the wrist and knees and an exaggerated hat with a long pointed peak. Around his shoulders is a tartan cloth. 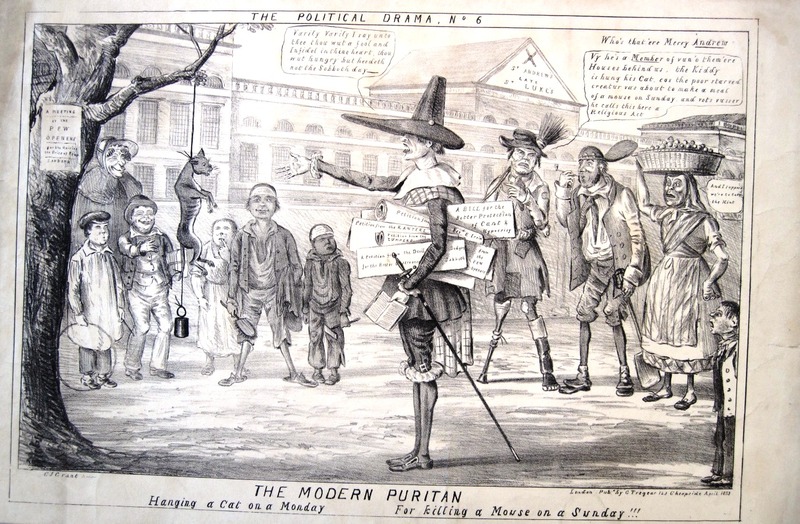 He is preaching to a cat hanging from a tree and watched by a crowd including young children.Underneath his left arm are a bundle of papers which have titles including “A Bill for the Better Protection of Cant and Hypocrisy”, “Petition from … Reverend E. Irvin(g)” , “A Petition from the Devil Dodgers for the Better Observance (of the) Sabbath”. He is standing in a space in front of a building named as “St. Andrew’s Late St. Luke’s” which is the St. Luke’s Hospital for Lunatics (Moorfields) which was opposite the Bethlem Hospital. The implication of the re-naming is clear and one of the on-lookers emphasises the point by saying in response to the question “Who’s that ‘ere Merry Andrew” — “Vy he’s a Member of vun ‘o them ‘ere Houses behind us, the Kiddy is hung his cat, cos the poor starved creature vas about to make a meal of a mouse on Sunday, and vots vusser he calls this here a Religious Act”. Sir Andrew is lecturing the cat with the words “Verily, verily I say unto thee thou wut a fool and Infidel in thine heart, thou wut hungry but heedth not the Sabbath day.” It is the theme of hunger and privation inflicted onto the working class which is carried forward in both prints seven and eight. The observers of this little drama are the sort of people that could be expected on a London street. However this print includes to the left a figure standing behind a group of children. Clearly dressed as a woman, who appears to be taking a pleasurable and confirmatory attitude to the whole event, who is she/he? Both the 1805 and 1822 editions of the book have an illustration of the Puritan hanging his cat although the 1805 edition  with the cat hanging from a tree is perhaps more nearly the inspiration of C.J. Grant’s caricature than the 1822 version . Braithwaite’s book was frequently republished; longevity for Barnaby if not for the cat. The original woodcut edition of The Modern Puritan which Grant produced for G. Drake. One of two versions of the image known to have been issued by Drake. On 6th March 1833, Sir Andrew Agnew announced that he intended to bring legislation before Parliament to curb Sunday trading and restore the sanctity of the Sabbath. The Sabbath Observance Bill duly sought to impose strict limitations on the types of business activity that could be carried out on a Sunday, with special emphasis being placed on stamping out practices that evangelicals found to particularly objectionable, such as the publication of Sunday newspapers and the opening of alehouses. Despite heavy opposition to the bill in Parliament and large sections of the metropolitan press, it received a rapturous reception amongst the growing congregations of evangelical chapels up and down the country, who responded by inundating Parliament with petitions of support. Their efforts were coordinated by the Lord’s Day Observance Society, which has formed in 1831 for the express purpose of securing legal recognition for the divine authority and sanctity of the Sabbath . Opponents of the bill, particularly the Radicals, angrily rejected the petitioners demands, arguing that most evangelicals were drawn from the affluent ranks of the middle classes and would therefore not be inconvenienced by the measures they proposed . Working people on the other hand, would find themselves unable to enjoy the most rudimentary leisure activities on Sundays, such as strolling public parks, and would even be unable to buy and prepare food (as poorer households were often reliant on the local baker’s over to cook meals). The Modern Puritan appears to have been conceived as a satirical rebuttal to the evangelical petitioning movement. The documents under Agnew’s arm carry titles such as “A petition from the Devil Dodger[s]”, “Petition from the Ranters”, and “Petition from the Jumpers”, the latter clearly attempting to associate the views of contemporary evangelicals with the excesses of the extreme puritanical sects of the seventeenth-century. Immediate inspiration for the design may also have come from an editorial in the Morning Chronicle of 20th February 1833, which urged the government to ignore the Sabbatarian petitions and quoted Braithwaite by asking its readers: “who had not heard of the Puritan – ‘who hang’d his cat on Monday for catching a mouse on Sunday’? No. 1. Protecting the Sabbath!!! Or Coercion for England. No. 2. The Modern Puritan. Hanging a Cat on Monday for Killing a Mouse on Sunday. No. 4. John Bull: or an Englishman’s Fireside. No. 5. Things not to be done on the Sabbath. No. 6. The Sinners before St. Andrew. Richard Pound, editor, C.J. Grant’s Political Drama, A Radical Satirist Rediscovered. University College London and The Paul Mellon Centre for the Studies in British Art 1998. Edward Irving (1792 – 1834). Irving had come to London in 1821 to minister to Scottish Presbyterian communities in the capital. However, he gradually drifted towards ever more extreme strains of evangelicalism, eventually breaking away to form the Holy Catholic Apostolic Church in 1832. Irving’s belief in Pentecostal phenomena such as speaking in tongues radical interpretation of the Bible ultimately resulted in him being branded a heretic and expelled from the Church of Scotland in March 1833. Drunken Barnaby’s Four journeys to the North of England,1805, J. Harding, No.36 St. James’s Street, London; 1822, T. and J. Allman, Princes Street, Hanover Square, London with lithographic illustrations by D. Dighton. Norris Pope, Dickens and Charity, (London, 1978), pp.44-45. 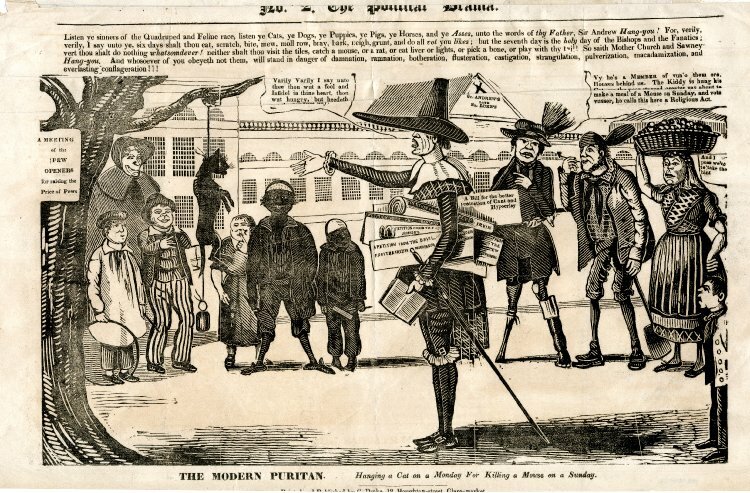 The Poor Man’s Guardian of 6th April 1833, described the bill as a measure “… for converting the people of England into hypocrites, slaves, and morose fanatics… It would convert a day of rest and enjoyment into a day of tribulation and misery. It would let loose a host of spies and informers on the country”. Radical activists also began disrupting Sabbatarian meetings with the aim of preventing petitions and motions of support for the bill from being passed. See The Morning Post, 28th February 1833. The name of the artist-engraver W. Newman appears on a handful of satirical lithographs published in London during 1834-35. 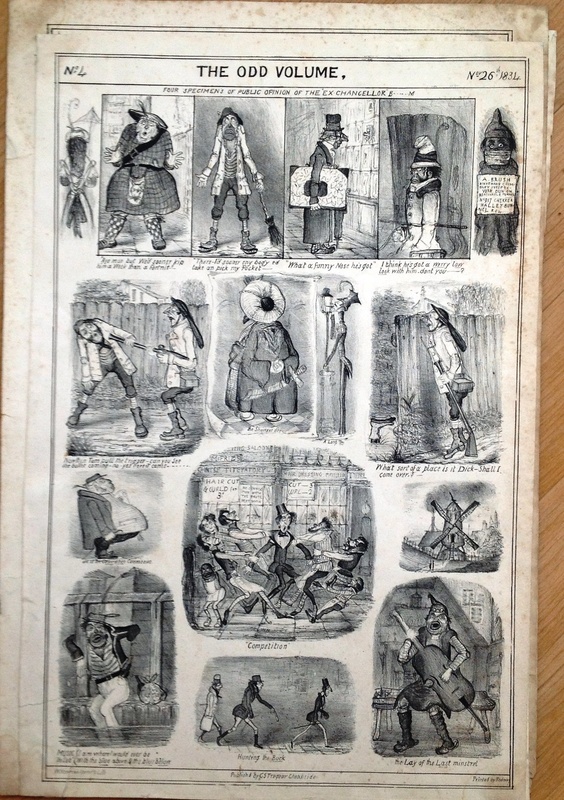 These works have previously been attributed to William Walker Newman (1817 – 1870), an artist who would go on to provide illustrations for the early editions of Punch before emigrating to America to pursue a career as a political satirist . 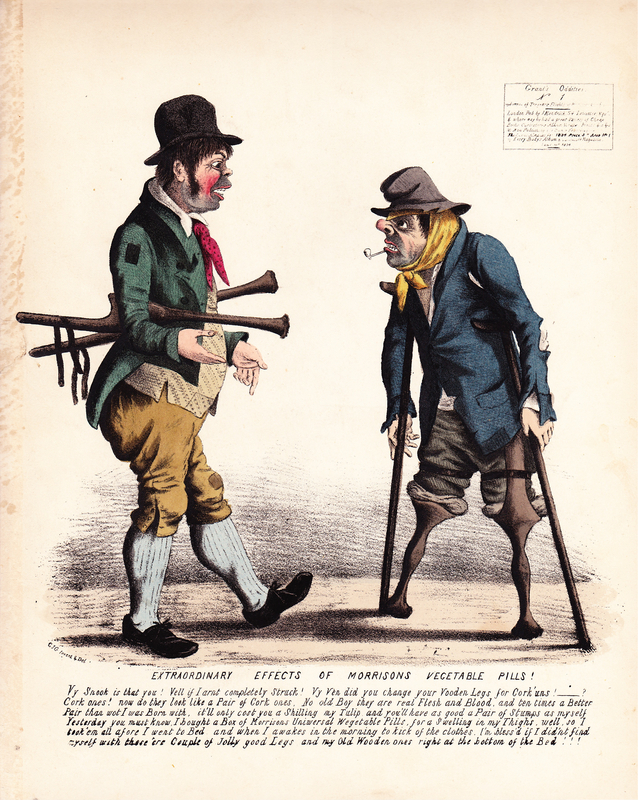 Assuming this attribution is correct, Walker’s early plates, produced whilst he was still a teenager, remain uncatalogued in any of the major institutional collections of British satirical prints . This post therefore aims to address that deficit by providing a brief summary of these works. One of the earliest plates to appear carrying Newman’s name was Female Emigration! which was published by G.S. Tregear of Cheapside in October 1834. The print mimics the style of C.J. Grant’s Every Body’s Album & Caricature Magazine, a popular fortnightly broadsheet of caricatures and scraps published by John Kendrick (and latterly Thomas Dawson) of Leicester Square, and presents a wholly unflattering view of life in Britain’s Australian colonies. Newman’s name appears on the undated Frontispiece to Useful Knowledge which was also published by Tregear. The design was once again adapted from earlier works by C.J. Grant, in this case the Frontispiece for the Penny Magazine of the Society for the Diffusion of Useful Knowledge Vols. 1 & 2 which were published by Edward Lacey and George Purkers respectively. The latter plate is dated 9th May 1833 and it is possible that Tregear hired Newman to produce his derivative version around this time, although the satirical frontispiece remained a popular trope in Grant’s work throughout the mid-1830s and the print could conceivably date from any point between 1833 and 1835. The four plates of a satirical scrap-sheet entitled The Odd Volume represent the most substantial product of Newman’s short-lived collaboration with Tregear. The project appears to have been conceived as a rival to the aforementioned Every Body’s Album… with the publication dates seemingly calibrated to ensure that each edition was issued a few days before Grant’s magazine. The four plates in the series are dated as follows: No.1 October 15th 1834, No.2 October 29th 1834, No.3 November 12th 1834 and No.4 November 26th 1834 . Newman also claimed to have engraved an unspecified number of plates for Flights of Humour and Rum Jokes, two long-running series of humorous lithographs published by G.S. Tregear over a number of years between c.1832 – 35. It’s not possible to quantify the extent of Newman’s contribution to either series, because the prints were normally issued without a publication date or artistic attribution. However it seems reasonable to assume that his involvement coincided with the period in which he was working with Tregear on the prints outlined above . Finally, Newman’s name appears on at least two other lithographic satires published around this time. The first is Frontispiece to the Law-List, which is very similar in style to Frontispiece to Useful Knowledge and was published by Orlando Hodgson of Clare Market. The second is Frontispiece to the Botanical Magazine, which was published by James Pattie from his self-styled “Wholesale Periodical & Caricature Shop” at No. 16 High Street, St Giles. This print is the most interesting of the two, being executed in a style which so different from that of Newman’s other works that it could almost be by a different hand altogether. Although the print is a lithograph, it has been etched in the manner of a copperplate engraving and is made up of deep lines that have been hastily scored into the stone. There are also numerous spelling and engraving errors in the text which have not been corrected prior to publication. The overall impression is of an artist working at speed on a low-budget product which was bound for an audience drawn from the bottom end of the market for printed images. B.E. Maidment, ‘Subversive Supplements: Satirical Title Pages of the Periodical Press in the 1830s’, Victorian Periodicals Review, Vol. 43, No. 2, Periodical Supplements (2010), pp. 133-148 The remainder of W.W. Newman’s career is outlined in Jane E. Brown and Richard Samuel West, William Newman: A Victorian Cartoonist in London and New York (Easthampton, MA: Periodyssey Press, 2008). The plates could be the work of William Richard Newman (1797 – 1855), a lithographic engraver and printer whose workshop was located at 27 Widegate Street in the City of London. Newman was the son of a copperplate engraver, William Newman (1770 – 1827), who specialised in the production of trade cards, tickets, and other ephemera, and certainly possessed the technical skills required to engrave satirical print. Newman traded under the name W. Newman, or Newman & Son. The business remained active under the latter name until the twentieth-century. My thanks to Mike and Daphne Tregear for providing me with an image of The Odd Volume No. 4. Newman signed Frontispiece to the “Law-List” as follows: “Designed & Lithographed by W. Newman. Author of the “Odd Volume”, “Female Emigration”, “Frontispiece to Useful Knowledge”, “Flights of Homour”, “Rum Jokes”, & c. & c.”. © Mathew Crowther and The Printshop Window, 2018. Unauthorized use and/or duplication of this material without express and written permission from this site’s author and/or owner is strictly prohibited. Excerpts and links may be used, provided that full and clear credit is given to Mathew Crowther and The Printshop Window with appropriate and specific direction to the original content. One of the nice things about collecting prints by C.J. Grant, or any less well-known artist for that matter, is that there’s always a much greater chance of coming across something that you’ve never seen before. Grant’s work was largely ignored for most of the twentieth-century and is not well represented in museum collections or studies of early nineteenth-century satirical publishing. This means that there’s still a comparatively large number of uncatalogued prints floating around out there for the private collector to find and that one has to try that little bit harder to work out what they’re about. This print is a recent addition to my own fairly modest collection of Grant’s work. Admittedly I had seen another version of this print before, illustrated on page 88 of the catalogue for the 1998 C.J. Grant, A Radical Satirist Rediscovered exhibition at University College London. However that version was a lithograph, published by Glover & Co. of Water Lane, Fleet Street as plate no. 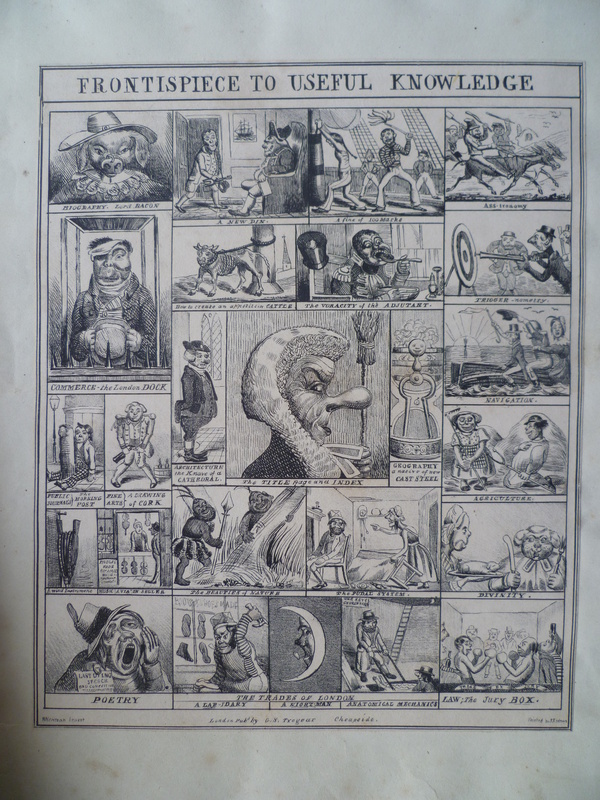 13 in the Glover’s Gallery of Comicalities series in June 1841, whereas mine is clearly a copperplate engraving. The two versions appear to be largely identical, save for the fact that Grant added his ‘CJG’ moniker to the lower left hand corner of the lithograph. The publication line has been trimmed from my print, so we don’t know who published it or whether Grant’s name appeared on it or not. It’s possible that it was also published by Glover, intended to be sold as a stand-alone caricature which was not part of the Gallery of Comicalities series. Alternatively it may have been produced for another publisher. During the mid-1830s Grant had produced two different versions of his Political Drama series for the printsellers G. Drake and G.S. Tregear. 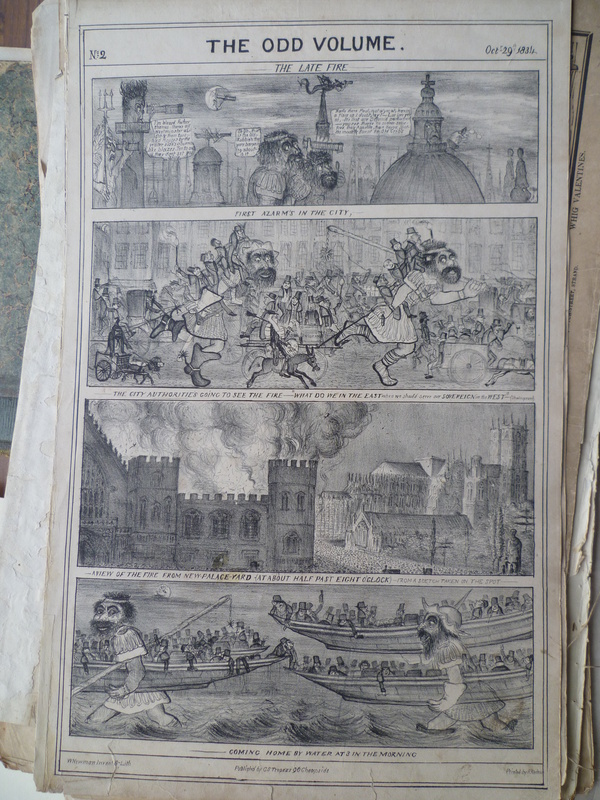 Drake’s Political Dramas were woodcut engravings, printed on cheap paper and sold for a few pennies. Tregear’s on the other hand were lithographs which were printed on good quality paper with delicate hand colouring. Clearly the two editions were aimed at entirely different parts of the market and this presumably explains why the two publishers were happy for Grant to make copies of the plates for their respective rival. My guess is that something similar happened here, as the paper and relatively basic colouring of this print strongly hints at it being a print that was intended for mass circulation rather than a more rarefied audience of middle class print collectors. The print is titled City Election! and refers to the election of candidates for the City of London during the 1841 General Election. Due to a quirk of history dating back to the creation of the parliamentary constituency at the end of the thirteenth-century, the City of London enjoyed the unique privilege of returning no less than 4 MPs to Parliament until 1885. In 1841 the City returned two Tory members, John Masterman and George Lyall, and two Whigs, Lord John Russell and Sir Matthew Wood. Grant shows all four crammed into a huge pewter tankard (l-r Lyall, Wood, Russell, Masterman). The sub-title A Pot of Half & Half refers to a beer cocktail – more commonly referred to as a Black & Tan today – which is made by pouring half a pint of porter onto a half print of beer. The lower density of the porter means that the two halves of the drink will not mix and remain entirely separate in the glass. Grant uses the drink as a metaphor for the adversarial nature of British politics and the unwillingness of the City’s representatives to cooperate with one another. A slightly more subtle interpretation of the print is that was intended as an attack on the political class as a whole; Grant is known to have been generally sympathetic to the Chartist cause and many of his prints display an even-handed disdain for mainstream politicians from both ends of the Parliamentary spectrum. By showing Whigs and Tories crammed together in the same pot, he may be trying to convey the message that the distinctions of party are irrelevant when it comes to their opposition to democratic reform and the enfranchisement of the working classes. For the final installment of their short series of articles about Gabriel Shire Tregear, Mike and Daphne Tregear present a fascinating biographical sketch of their ancestor’s life and major works. 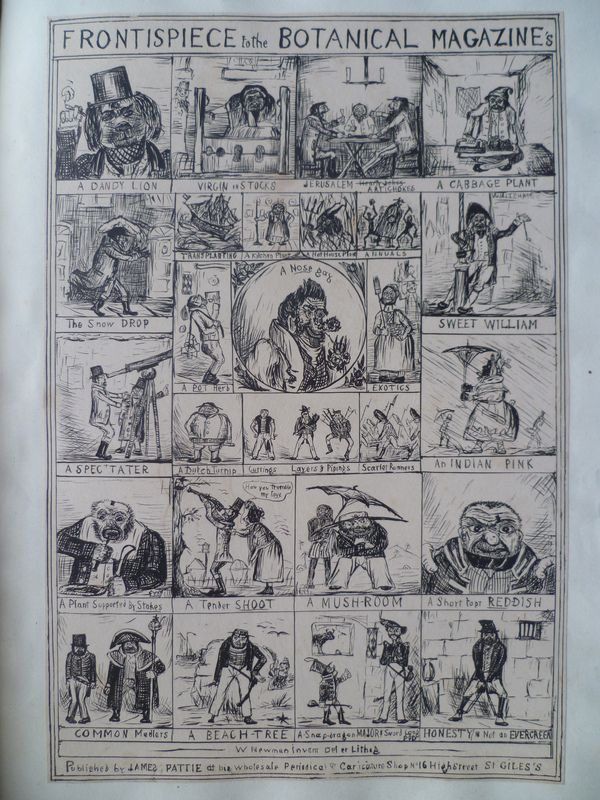 From about 1833 the printshops (Marks, Tregear, Spooner, and Hodgson) produced degenerate coloured etchings or lithographs, such as Spoonersʼ ʻFunny Charactersʼ or Tregearʼs ʻBlack Jokesʼ (on negroes), which seems to be ancestors of the comic postcard. 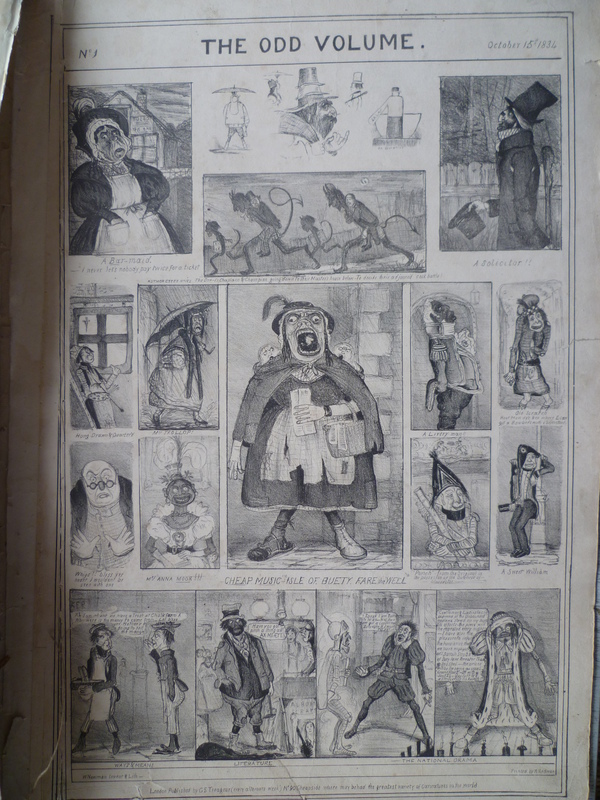 Such things have an interest for the social historian; they have little to do with ʻpolitical and personal satiresʼ, or with comic art, which was chieﬂy represented by George Cruikshankʼs illustrations, notably My Sketch Book (1834-6) and the Comic Almanack (1835-6). HB [the artist John Doyle] had given caricature a new look, and from 1831 his imitators were at least as numerous as those of [William] Heath had been in 1829. In 1832 and 1833 there are none of Heathʼs coloured etchings; in 1834 he did a few for Tregear, a decline indeed from the years when McLean was his ʻsole publisherʼ. Gabriel Shire Tregear represents the movement towards cheaper prints; he was also an engraver. So, in the British Museum world of Dorothy George, Tregear was deﬁnitely well below the salt although 31 Tregear prints are included in the 1954 volume of the BM catalogue, of which seven are not overtly political. It is possible that Tregearʼs need to satisfy the cheaper end of the market was a decision made for him. He was born in 1801 or 1802 and died aged 39 in 1841. His parents (Henry and Elizabeth) are believed to have relocated from Truro, Cornwall, to London after 1800 (Henry Tregear is described in a family will of 1801 to be ʻlate of Truroʼ). In 1821, aged 19, Gabriel Tregear is married by licence to Ann McLean, the sister of the printseller and publisher Thomas McLean who had premises in Hay Market and concentrated on catering to an upmarket clientele in Londonʼs West End with exclusive products. While Thomas McLean may not have wished his sister to starve, a brother-in-law who encroached on his livelihood would not have been welcome. Tregear later kept a good distance away from the McLean printshop both geographically and in terms of the focus of the business. The authors have not found any documentary evidence of how Gabriel Tregear, the son of a Cornish carpenter with no obvious connections, came to acquire the skills to draw and colour various kinds of prints and attach himself to the McLean family; however, society at that time provided plenty of examples of talented individuals who were successful, rose in society and came to public notice. Tregearʼs publishing career began slowly. In 1823 he published the third edition of Spilsburyʼs ʻPicturesque Scenery in the Holy Land and Syriaʼ (Thomas McLean had published the second edition) from an address in Southwark, the ﬁrst time his name appears professionally. In 1826 Tregearʼs occupation was still print colourer at his childrenʼs baptism and he had moved back north of the river Thames to Drury Lane. Also that year he published his own material from St Peterʼs Alley, Cornhill. In 1827 and 1828 he published prints from 104 St Martins Lane. An advertisement from the Royal Cornwall Gazette from 28th July 1827 shows him perhaps using his Cornish roots to advantage, advertising a coloured engraving priced 10s. 6d. of Cornwall and Devonshire wrestling and stressing at the bottom that ʻThe County Colours, Arms, Mottos, &c. are admirably displayed.ʼ Another Cornish-themed print shows ʻJames Polkinghorn, The celebrated Cornish Wrestler and Champion of the Worldʼ (left). 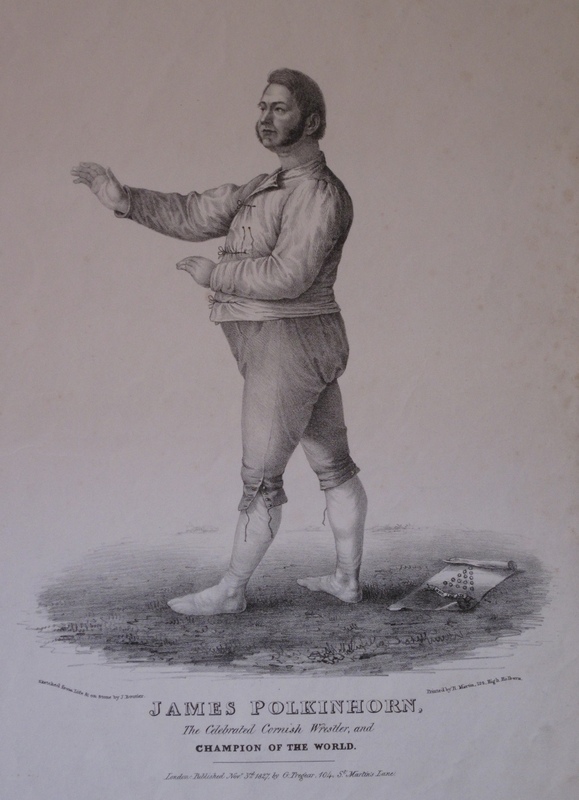 This lithograph shows Polkinghorn standing facing to the left with his arms extended as if waiting for an opponent’s move. He is wearing a shirt, open at the collar, knee breeches and stockings. James Polkinghorn was the landlord of the Red Lion Inn at St. Columb Major, Cornwall. He has been described as ʻhaving a neck like a bull, dark curling sideburns, piercing eyes and a determined jawʼ. On the 26th October 1826 he fought a match against the champion of Devon, Abraham Cann, and won. As well as sporting prints, Tregear has a line in theatrical prints. 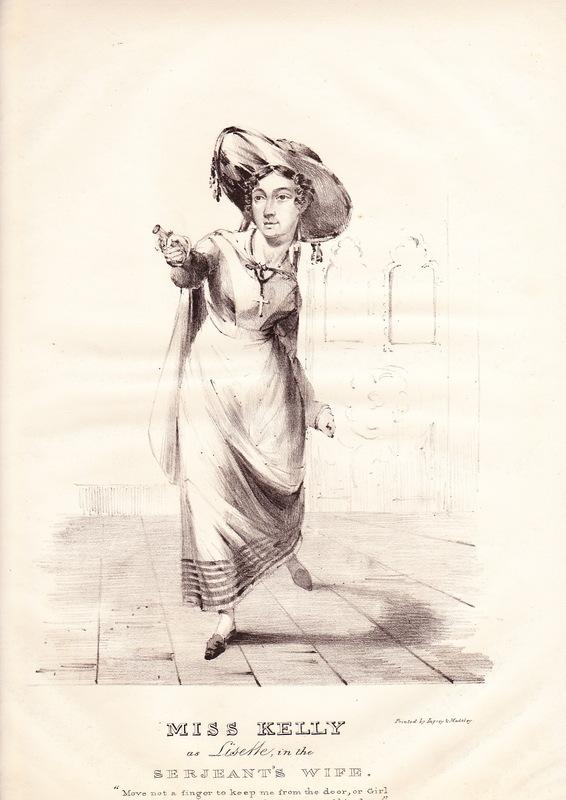 One lithograph shows ʻMiss Kelly as Lisette in the Sergeant’s Wifeʼ (below right); Frances Maria Kelly had particular success when she appeared as the Sergeant’s Wife at the English Opera House, The Strand, during the 1827-8 season. From St Martins Lane he moved to premises in Cheapside, then as now one of the busiest streets in the City of London. From 1828 until 1835 he occupied number 123 on the northwestern corner of Cheapside and Wood Street in one of the four shops built on the old churchyard of St Peter Westcheap. This building has since been demolished and the shop next door has been renumbered 123-124. The John Johnson Collection at the Bodleian Library, Oxford, has a lithograph drawn by Tregear of his shop at this address in 1829 (See also http://www.fotolibra.com/gallery/509178/wood-street-cheapside-london/ for an image drawn in the 1870s). On Saturday morning, about 11 oʼclock, as a boy named William Gunton, son of a watch- spring-maker, No. 3 City-gardens, was standing at the corner of Wood-street, looking at a caricature-shop window, a wagon in passing caught his arm between the stump (put up by the city for protection) and nearly severed it from the body. He was immediately taken to St. Bartholomewʼs Hospital, and the arm was amputated. There is every possibility of his recovery. The corner of Wood-street is rendered exceedingly dangerous by the exhibition of caricatures, as it invariably induces a crowd to assemble round the shop. On the Saturday previous, a gentleman named Bragge nearly lost his life, within a few yards of the same spot, and numerous robberies are continually occurring. Further troubles caused by the crowds outside his shop were reported a month later in The Times. A case was heard at Guildhall concerning a man charged with assaulting a police ofﬁcer stationed outside Tregearʼs print shop, his friend who then tried to rescue him, and another man charged with trying to excite the crowd against the police there. At the last sessions, the print-shop in Cheapside, at the corner of Wood-street, was indicted by the city as a nuisance, and a verdict was obtained, but the judgement was deferred till the next session, to give Mr. Tregear an opportunity of abating the nuisance. Not having done this, however, those who have the direction of the city police have stationed four men and a serjeant about the windows, who compel persons who stop to gaze at the pictures to keep moving. On the other, hand Mr. Tregear stands at his door, and tells those that are interrupted by the police that they have a right to stay, and altercations ensue. Mr. Walters, a solicitor, who attended on the part of Mr. Tregear said, that the stationing of the policemen around the house, to prevent anyone from stopping for a moment at the window, was a monstrous invasion of the rights of the subject, as respected the public, who were driven from the window, and the citizen, whose trade was ruined by the driving away of his customers. It was a fact, that Mr. Tregear used to take 60l. [£60] a week, but since his house had been surrounded with policemen, he had taken only 10s. a day. Mr. Tregear had in fact abated the nuisance, by diminishing the number of prints displayed in his window. His show was formerly of the value of 100l. [£100]; it was now worth but 14s., and was smaller than that of any other print shop in the city. The power assumed by the police was most dangerous, as it was as applicable to a haberdasher, or any other tradesman whose show of bargains might attract a crowd, as to a print shop. Some conversation arose whether the complaint was within the magistratesʼ jurisdiction, as in the case of Tregear, the caricature vender, in Cheapside, who was indicted for occasioning an obstruction of the footway, by exhibiting his pictures, the Recorder had so strong a conviction of the illegality of the proceeding, that although the jury convicted him, he was not called up for judgement. It was remarked, upon this occasion, that, upon the same principle on which this conviction was founded, the beautiful daughter of a pastrycook, at the west end of the town, who attracted a mob about her fatherʼs window, might have been indicted as a nuisance. As well as being a dangerous place to linger, printshop windows also acquired a reputation for places where the pedestrians were likely to be targeted by pickpockets or gropers. In December 1827 Vincent Tregear, one of Gabrielʼs nephews, was indecently assaulted outside a Drury Lane printshop, with the perpetrator being duly imprisoned. 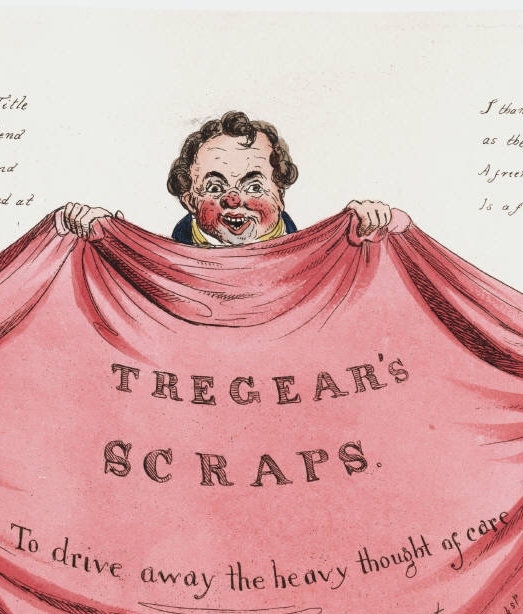 Tregear advertised his wares in The Times and The Morning Chronicle as well as other newspapers. These advertisements are useful when attempting to date a print which has no publication date printed on it (the case for over two-thirds of the authorsʼ collection). With no advertisement available, an approximate guide is the address given for Tregearʼs print shop, although in many cases the address is simply given as Cheapside. The margins of Tregear prints offer the occasional useful snippet, e.g. the 1832 print ʻJust Come From Grass!ʼ has references to ʻTregear’s Humorous Catalogueʼ and ʻBeware of Imitationsʼ and to the right a listing of some of the prints and print series which Tregear has for sale for 1 shilling each. These are: Leaseholder; Living Cheap; Compliments of the Season; Chip of the Old Block; Matrimony; Tragedy and Comedy; Humorous Scraps (6 plates); Tenant at Will; Keeping the Peace; Tregear’s Flights of Humour 16 plates; Black Jokes 12 plates. Thereʼs another tantalizing reference to ʻTregear’s Catalogue of Humourous Printsʼ in the margin of ʻThe Robin Hood Family of Archers of 1833ʼ of which no trace has surfaced. TOOTH-ACHE, 57 Pall-mall, and 96, Cheapside. TRACYʼs newly discovered SPECIFIC is mild, innocuous, and soothing, and immediately removes the most acute suffering and destroys all sensitiveness in the nerve without the least pain or injury to the teeth, and now renders the painful operation of extraction unnecessary, by effecting not a temporary but a permanent cure. This wonderful preparation is sold in bottles, price 4s. 6d. and 7s. each, stamp included, at 57, Pall-mall, and at Mr. Tregearʼs, printseller and publisher, 96, Cheapside. Tregear embraced all aspects of the humorous arts, including the nudge-nudge-wink-wink variety. An 1829 lithograph entitled ʻA Literary Lady displaying her Allbumʼ (above) has the second ʻlʼ in allbum deliberately crossed out. The scene is a stylish drawing room with a young woman, who is holding a book and a fan, with a soldier in the foreground. The woman is wearing a dress with a very large bustle to the rear and a low-cut bodice. 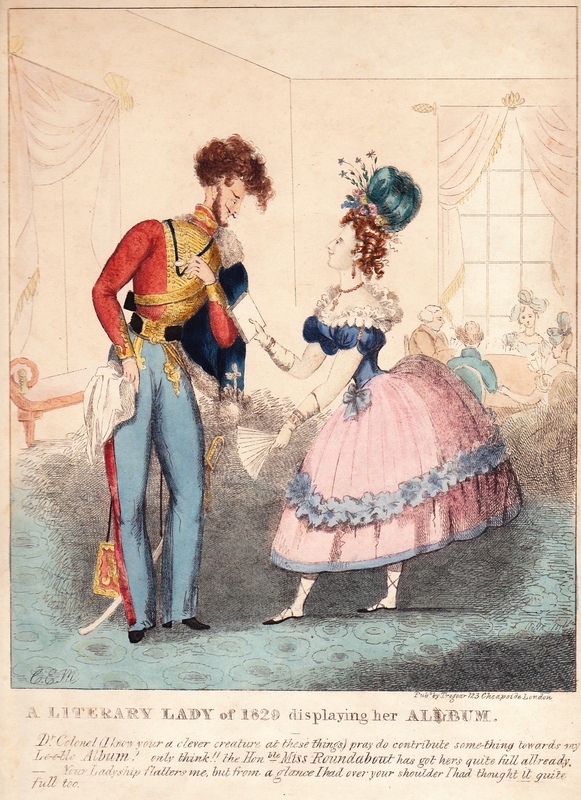 The soldier is positively leering at her and obviously referring to her derrière. Another example is ʻMad_m V_____s Legsʼ (left) in which the head and shoulders of two fashionable young men are dreaming with their heads in the clouds. Between them, on a ﬂoating board, is the ﬁgure of a woman from the hips down wearing a skirt which stops above the knees. 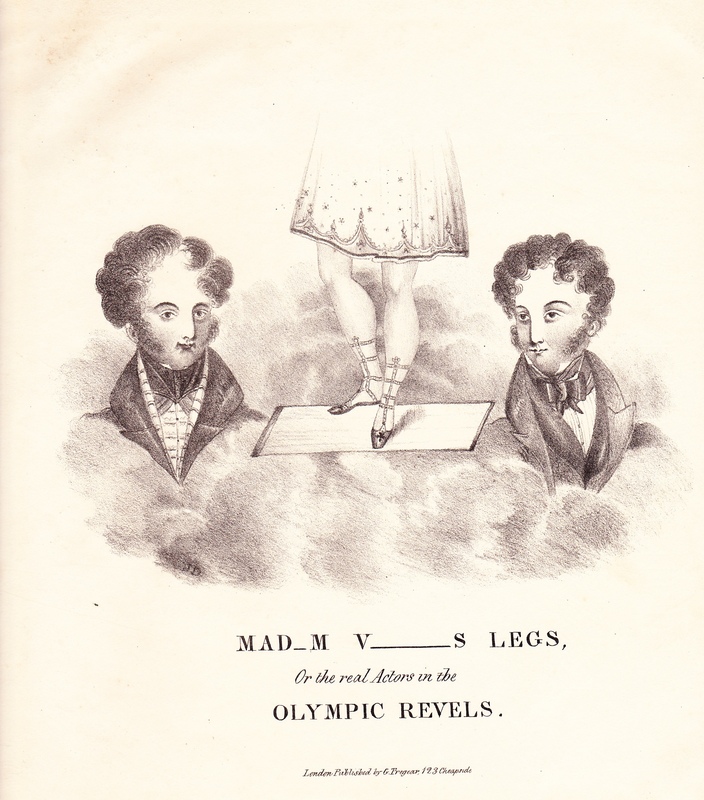 On the 3rd of January 1831 Lucia Elizabetta Vestris, proprietress and manager of the Royal Olympic Theatre, opened her tenure with a show which included Vestris playing Pandora in a set named Olympic Revels. The comeliness of Vestris’s legs was the source of much commentary in newspapers of the time. Optical illusions which allowed a picture to work in two ways remained popular. 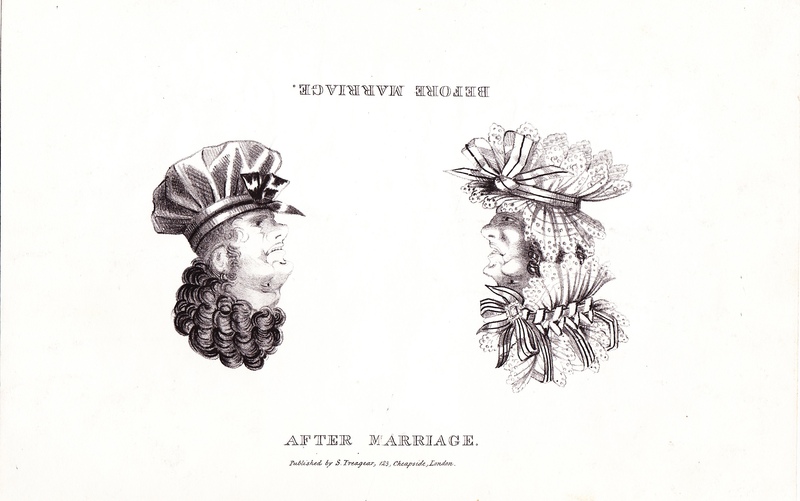 The ʻBefore Marriage/After Marriageʼ (right) lithograph contain the heads of a man and a woman facing one another with a happy expression, then unhappy faces consequent on marriage. As mentioned above, Tregear published many series, of which ʻFlights of Humourʼ appears to be the longest, running to 95 prints at least. 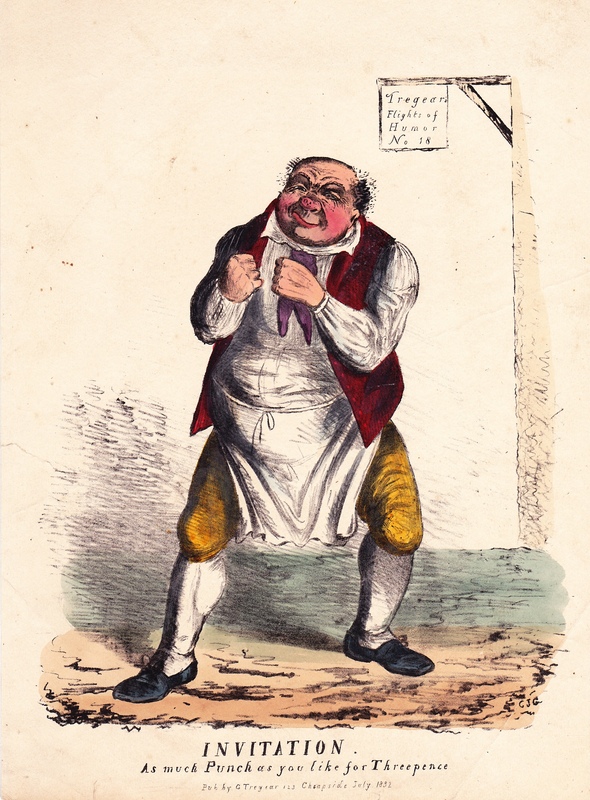 Number 18 (left) shows a large publican in white apron and waistcoat taking a ﬁghting stance with clenched ﬁsts with the caption ʻAs much Punch as you like for Threepenceʼ. Few of the printers used were named on Tregearʼs print; of those that were, Lefevre & Kohler (52 Newman Street) were often used. As a publisher he was dependent on good working relationships with the printers and artists he used. These relationships were not always smooth ones. In 1832 Tregear sued Auguste Ducôté, a lithographic printer, for printing from one of Tregearʼs lithographic stones stored with him without permission and selling these copies. The case did not appear to go to court, and the authors have not seen any examples of the print which was the subject of the litigation. 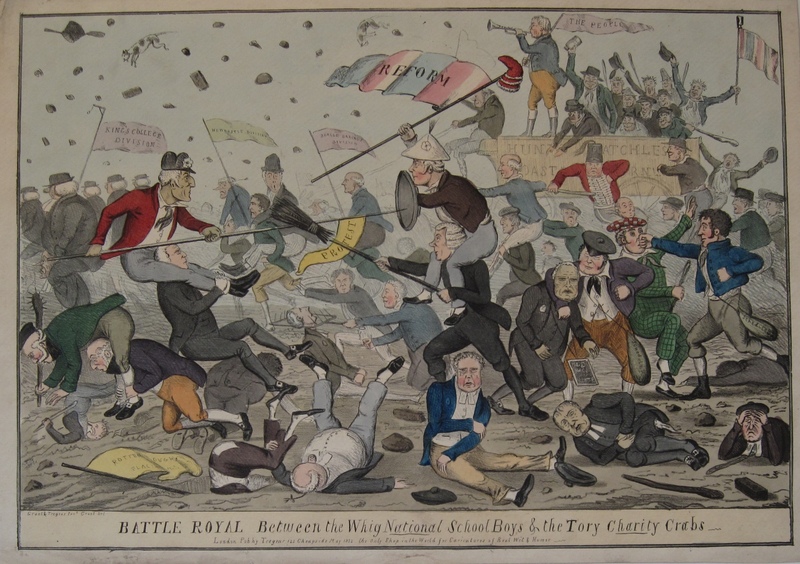 Charles Jameson Grant is credited for the design (with Tregear) and the drawing of the splendid ʻBattle Royal Between the Whig National School Boys & the Tory Charity Crabsʼ (right) of 1832. 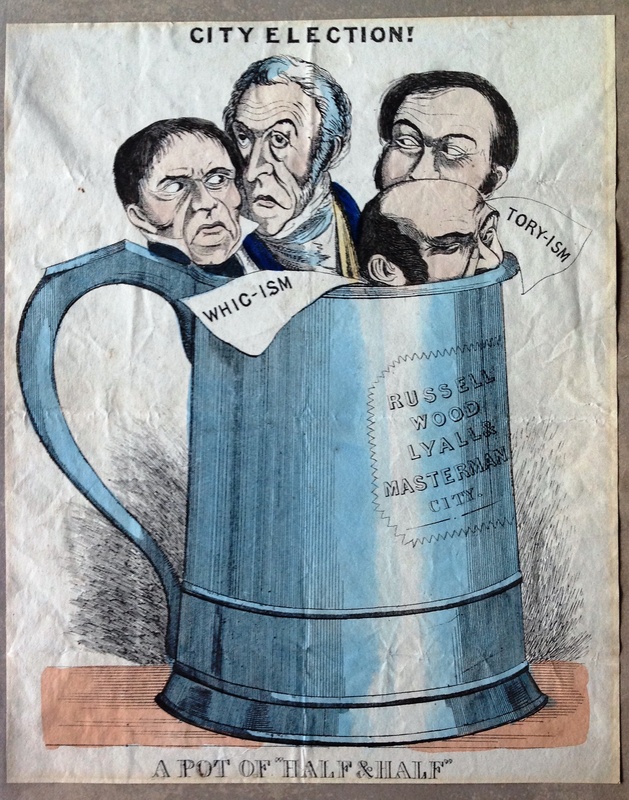 The Whigs on the right of the image, holding the banner of ʻReformʼ (which is held on a pole surmounted by a Phrygian bonnet), are in battle with the Tories on the left. The Tories are led by Wellington, Cumberland and Ellenborough. The Whigs are led by Grey, Brougham and Cobbett. Bricks, cudgels and brooms are all being used as weapons. Other ﬂags are being held which include ʻRotten Borough Placeʼ, ʻKings College Divisionʼ, ʻNewcastle Divisionʼ, ʻDeagle Baring Divisionʼ. 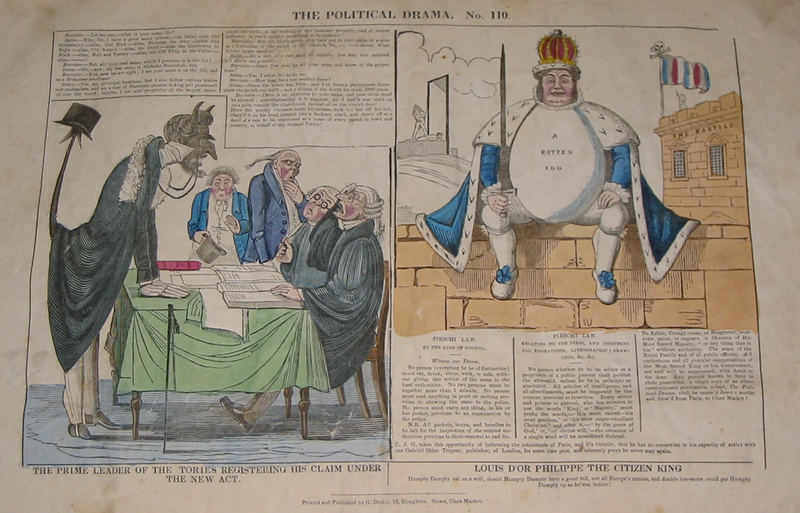 The print is considering the position in 1832 where Grey is manoeuvring to force the Reform Bill through Parliament and showing the intense feeling of unrest in the country. 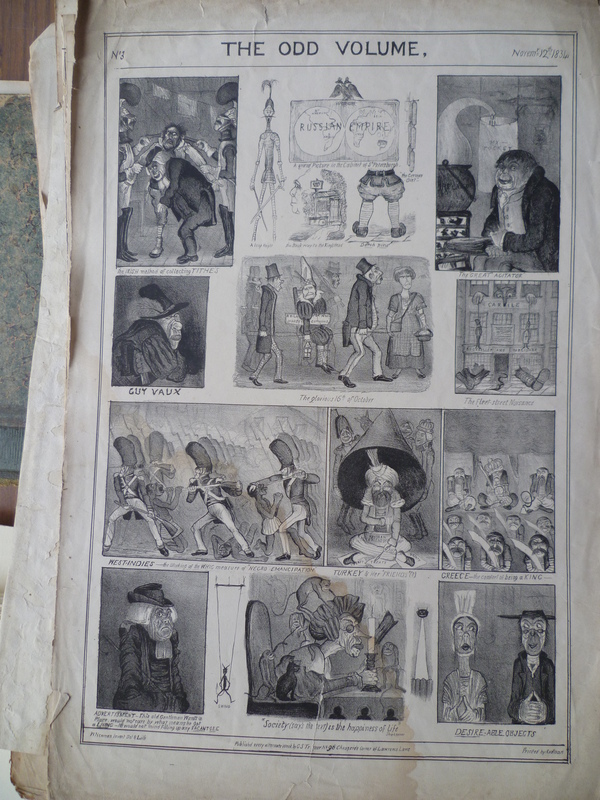 On the bottom of the print is written ʻthe only Shop in the World for Caricatures of Real Wit and Humorʼ. In 1833, or soon after, Tregear quarrelled bitterly with the C J Grant. Grantʼs ʻThe Political Drama. No. 110ʼ contains the following sentence on the bottom right of the print: ʻC. J. G. takes this opportunity of informing the inhabitants of Paris, and itʼs vicinity, that he has no connexion in his capacity as artist with one Gabriel Shire Tregear, publisher, of London, for some time past, and solemnly prays he may never againʼ. Prior to this dispute Grant had been credited as artist with many of the political prints published from 123 Cheapside, and on some of the ʻTregearʼs Flights of Humourʼ, ʻPolitical Dramaʼ and ʻTregearʼs Burstyʼrsidesʼ series. Some other artists were also given credit on his early work, including Henry Alken, Robert Seymour and Isaac Robert Cruikshank. Others were credited only by their initials and often not at all. W. Newman is credited as the artist on ʻFrontispiece To Useful Knowledgeʼ of 1833 (above). The sheet has 25 small engravings tightly grouped together and while the title would suggest that each is going to illustrate some useful fact, the reverse is the case. Each panel is a pun, a play on words. The centre piece is a caricature of Lord Brougham. The whole thing is conceived as a wry comment on the political and educational movement which is trying to bring information and knowledge to the working classes. It looks very similar to the mock frontispieces done by C J Grant, done partly to make fun of the ʻscrapsʼ phenomenon as well as the worthy politicians like Lord Brougham. However, Tregear would have done well from his prints intended to be cut out and placed in scrap books as well; ʻTregearʼs Scraps 5ʼ from 1830 is one such. Two further images deserve their own blog entries. 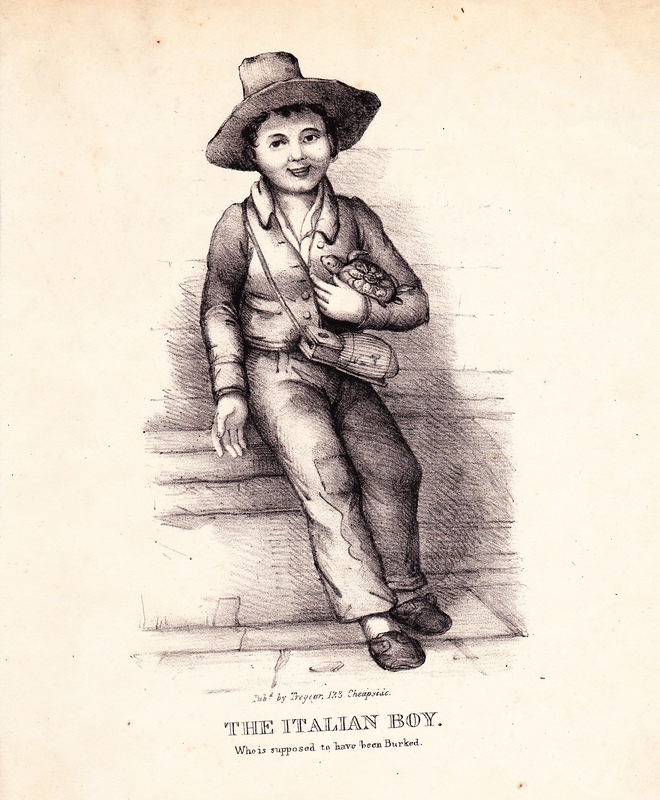 ʻThe Italian Boyʼ (left) was the subject of extensive coverage in the newspapers in November and December 1831. Four men, Bishop, May, Williams and Shields, were accused of the murder of a young boy, believed to be an Italian beggar, in order to sell the body for dissection. This case inﬂuenced the subsequent passing of the Anatomy Act 1832, which expanded the legal supply of medical cadavers to eliminate the incentive for such behaviour. 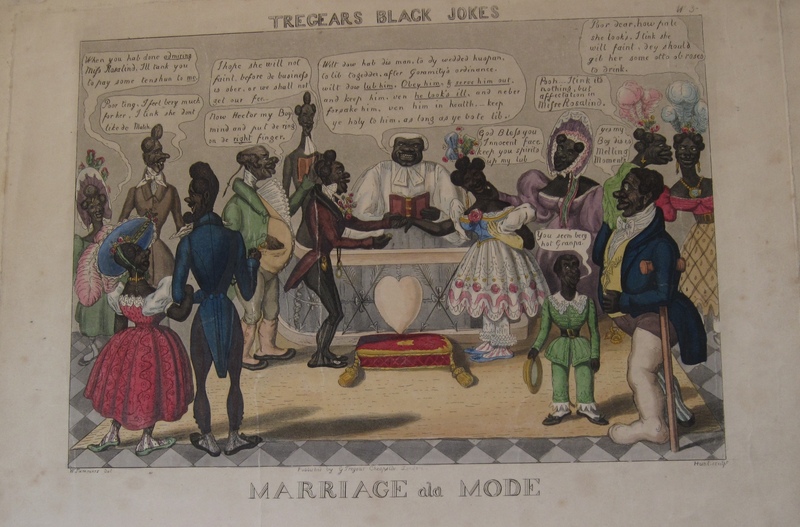 ʻTregearʼs Black Jokesʼ were described in an advertisement as ʻbeing a Series of Laughable Caricatures on the March of Manners Amongst the Blacksʼ. Number 3 (below right) shows a marriage scene in which a priest is reciting the marriage vows. All of the characters are black and dressed in fashionable clothes. Each character is making a remark about the couple. This print is racist; the tenor of the print is to deride the ceremony and to use the mode of speech to denigrate black people. ʻBlack Jokesʼ had a similar theme to ʻLife in Philadelphiaʼ, Tregear having stolen the idea from American artist Edward Williams Clay. Although he continued to occupy 123 Cheapside until 1835, some of Tregearʼs advertisements show he used both 123 and 119 Cheapside in 1831. At some time during the 1830s he also appears to collaborate with other printsellers occupying 90 Cheapside; this address was used for the 1834 publication of ʻFemale emigrationʼ, a splendid hand- coloured lithograph describing the perils faced by women moving to the colonies (in the collection of the National Library of Australia, see http://nla.gov.au/nla.pic-an6589607). In 1834 he signed a 21-year lease for 96 Cheapside from where he operated until his death in 1841. This printshop was at the northeastern junction of Cheapside and Lawrence Lane; this southern end of Lawrence Lane has been removed since. 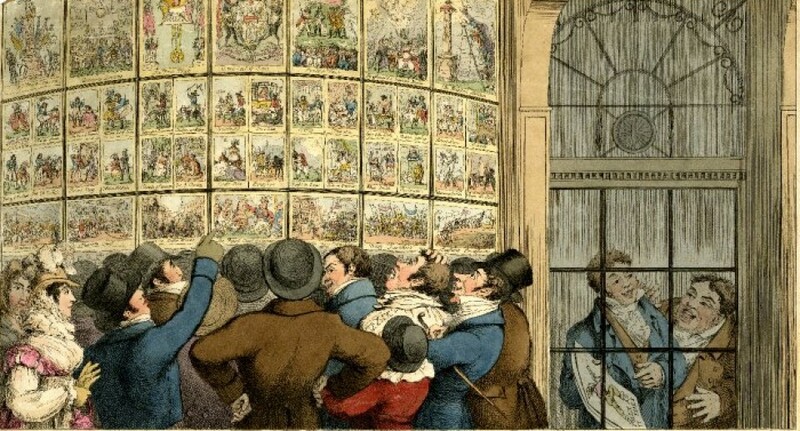 Towards the second half of the 1830s Tregear advertised fewer prints and more music; it appears that the demand for comic and sporting prints was falling. However new prints were published, particularly of the grand occasions that the accession, coronation and marriage of Queen Victoria warranted; one lithograph depicts a delicate and respectful portrait of the new queen ʻVictoria the Firstʼ. The publishing of series continued; ʻFancy Sketchesʼ, ʻFlowers of Lovelinessʼ, ʻFlowers of Uglinessʼ, ʻIllustrations of Popular Songsʼ, ʻMerry Thoughtsʼ, ʻTregearʼs Flights of Humourʼ, ʻTregearʼs Rum Jokesʼ, ʻTregearʼs Sea Songsʼ, ʻTrip to Margateʼ, ʻWho Are Youʼ, ʻTregearʼs Headsʼ, ʻTregearʼs Sea Songsʼ, ʻTregearʼs Humorous Scrapsʼ, ʻFancy Sketchesʼ, ʻTregearʼs Rum Jokesʼ, and ʻSchool of Designʼ all began or continued their series at 96 Cheapside. They must have been good money-spinners. On 21st February, 1841, Gabriel Shear Tregear died at 18 Goulden Terrace, Islington, of inﬂuenza aged 39. He was buried in the burial ground of St. Martin in the Fields in Camden Town. His estate was valued for probate at £600. His widow continued to operate the business in partnership with Thomas Crump Lewis after his death under the Tregear & Lewis name, also selling musical instruments. Bankruptcy forced its closure in 1844 after the pair fell out spectacularly and knocked each other over the head with a number of violins. The great London emporium was a perfect exhibition in itself. My father, sir, was a famous publisher. Sir Edwin Landseer was a great friend of my father and a frequent visitor to his house. It was a noted rendezvous of all the great wits, artists and authors of London. Thackeray, Tennyson, Mark Lemmon, Hood, Thornton Hunt, Edmund Yates, Brontaire OʼBrien, Ernest Jones, Carlyle and men of that literary ilk. She then goes on to describe a close relationship with Charles Dickens as a child and playing chess with him when aged 16 (about the same time Dickens met and fell in love with the 18 year old Ellen Ternan). While she has no doubt exaggerated the wealth and status of the family while she was a child and the extent of the family connections with the famous, which may have been more in the nature of purely business dealings, the basic facts of the family life bear scrutiny. This is as close as the authors can get to any accounts of Gabriel Tregear as a person. In their second article for The Print Shop Window, Mike and Daphne Tregear discuss the troubled relationship between the printseller and publisher G.S. Tregear and the caricaturist Charles Jameson Grant. C. J. G. takes opportunity of informing the inhabitants of Paris, and its vicinity, that he has no connexion in his capacity as artist, with one Gabriel Shire Tregear, publisher, of London, for some time past, and solemnly prays he may never again. He was informing the inhabitants of Paris of this rift within the context of the larger panel; he was also, of course, informing the whole of the print readership. What is clear from this statement is that Grant put a great distance between himself as the creator of well-known and widely distributed images, and Tregear, with whom he been a long-time collaborator. The working relationship between Tregear and Grant can be illustrated by the fact that in 1830 Tregear published at least two prints which are identified as being by Grant. These are ʻAll A Gog at Guildhallʼ and ʻFrench Mode of Proceeding Ex Officioʼ. In 1831 this number rose to 13 prints, in 1832 to 17 prints and in 1833 there were 7 prints. In addition, the authors have found five which are undated, but are clearly by Grant. The prints vary in content from the classic political commentary prints of the time focussing on the reform acts, through to the simply frivolous and entertaining. Whether the prints are the result of collaboration between caricaturist and publisher as, for example, ʻThe Robin Hood Family of Archersʼ, where there is a joint claim to authorship, or merely a commercial transaction with Tregear specifying the print’s content, is not clear. What is certain, however, is that Grant did value his association with Tregear and took pains to both publish this association and exploit it – at least for a period of their relationship. Grant, along with a number of other satirists of the period, finds the claims by Morrison for his vegetable pills a pure absurdity. 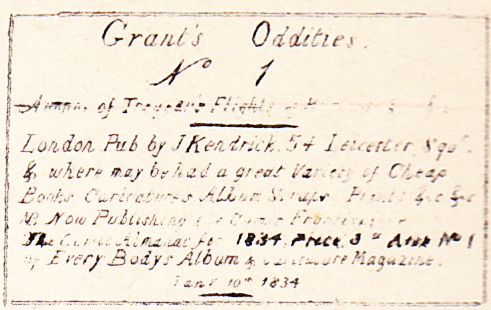 Both Grant’s ʻOddities No. 1ʼ (left) and Grantʼs ʻOddities No. 8ʼ, published by Kendrick, poke fun at the potential effects of vegetable pills. On print No. 1 Grant used the opportunity to claim to be ʻAuthor of Tregearʼs Flights of Humour &c &cʼ. The claim is placed prominently in the panel [*] in the top right hand corner of the print (it is more clearly seen on the back and white copy of this print in the Lewis Walpole Library). Tregear’s ʻFlights of Humourʼ was the longest series both in terms of time and number which he published. They are largely undated, although sporadically they are, and the authors have been able to trace the series, although not all of the titles, from 1 to 95. And again, not all of the prints are signed by Grant. Tregear and, later, Tregear and Lewis, were not always the best at quality control in terms of numbering, so it is possible that there are unused numbers. The earliest are Nos. 2 and 3 from 1830, No.10 in 1831, No.18 in 1832, Nos. 27, 30, 32, and 33 in 1833, No. 37 in 1834, No. 50 in 1835, Nos. 52 and 53 in 1836 and No. 60 in 1839. If the rift in the relationship between Grant and Tregear as advertised by Grant on ʻThe Political Drama No. 110ʼ is as final and abrupt as Grant implies, then it is unlikely that Grant can be the author of the whole series. Possibly, he provided material up to No. 50 and thereafter a new author or authors were found to continue the series. Or, that the split between the two men was not final, and they did reform their association. However the authors have not seen any evidence that the relationship did revive. In conclusion, it is of interest to note that the disagreement between the two men did lodge in the public consciousness. While responding to an article about Cleave in ʻNotes and Queriesʼ in February 1870, a correspondent, Mr. Lamb, makes the following remark “Earlier than any of the above dates, namely, in 1833, I find Mr. Grant’s name to a coloured caricature published by G. S. Tregear, ʻThe Robin Hood Family, or Archers of 1833’, and, I believe Mr. Tregear published many coloured caricatures for him. They quarrelled somehow, and I recollect of a very personal correspondence between them”. How do we get to a better understanding? The authors are grateful for the kind permission of the Working Class Movement Library, Salford, for permission to reproduce images of ʻThe Political Drama No. 110ʼ.